Generally when we think about growing plants hydroponically we think about complex setups with water pumps, air pumps, artificial lights, environmental control and greenhouses. However, it has been shown through many controlled experiments and experiences that hydroponics can be made in a much less fancy way, so simple in fact that pumps and other such appliances that consume electricity can be effectively and totally eliminated from the growing system without the need to lose a significant amount of crop quality or yield. On today's article I want to discuss some of these extremely simple setups and how you too can effectively and efficiently grow a hydroponic crop with low cost and absolutely no usage of electrical power. Traditionally hydroponic systems - especially in developed countries - have been extremely dependent on electricity to make them work properly. Water pumps are used to carry fresh nutrient solution towards the plants and air pumps are used to keep the nutrient solution saturated with oxygen. However the truth is that such complicated setups are actually NOT necessary for successful hydroponic growth if adequate system design is actually made. People in less developed areas of the world such as South America, China and India have been experimenting with completely passive hydroponic setups to replace the more traditional energy intensive hydroponic growth and they have done tremendous progress to achieve this goal. Many of you are probably already thinking about all the possible problems this might have. You might be thinking that this might work for small plants - like lettuce and some herbs - but never for nutrient hungry plants such as tomatoes, pumpkins, watermelons, etc. The fact is that these entirely passive non-recirculating systems work for ALL of these plants, providing adequate growing conditions and high yields typical of hydroponic systems. Right now it is not a matter of opinion or discussion if it can be done as MANY studies and controlled experiments already show this is a reality. You can see some clear examples here, here and here. If this three conditions are met you will be able to build a passive hydroponic growing system that needs NO air or water pumps to give a good yield. How can you make such a system ? The systems that have given the best results up until now are those that follow a very simple design scheme. The plant is put in an absorbent nutrient media and placed to float or stand just above the initial nutrient solution level. The level of nutrient solution slowly falls down in the beginning (due to evaporation) and then quickly as the plants start to absorb water and nutrients. As the level of nutrient solution lowers the plant roots become exposed to layers of air from which they can absorb oxygen, allowing them to effectively absorb nutrients from the below stagnant solution without those roots dying. 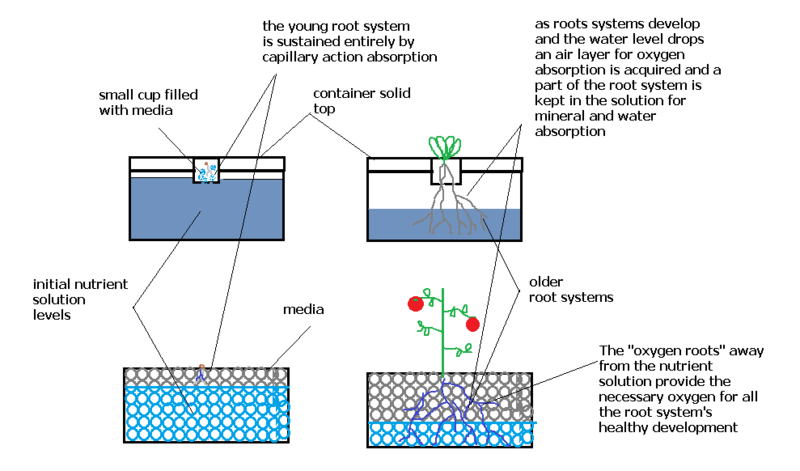 Most people believe that if roots are submerged in an unaearated solution they will die but this is only true if the whole root system is submerged. If a good part of the system is given an "air buffer" from which to absorb oxygen and this space remains humid, the result is a system that can absorb nutrients from the unaerated solution and oxygen from the air buffer zone. This has in fact been shown to work in many cases (you can follow the links mentioned before for some examples). For big plants such as cucumbers and tomatoes you would want to use a container filled with solid media to support the whole plant with the initial nutrient level being just a few inches below the surface while for smaller crops a "fixed top" idea might work much better. 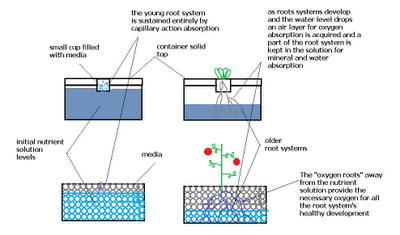 In the above image you can see both systems and how they evolve as the crops grow. For larger crops you might also want to replenish some solution every month so that the crops can get all the water and minerals they need if the actual container is not large enough to hold all the water the plant would use through its whole life cycle. Without a doubt passive hydroponic systems like these ones will become extremely important in future world agriculture (especially in developing countries) since they are able to give us many of the wonderful advantages of hydroponics without the problem of complex electronic equipment, water, air pumps or an inherent dependency in the electric grid (which is not available everywhere in rural third world countries). Hopefully this information will also be useful for those looking to establish some passive and effortless hydroponic gardens to have fresh crops year round :o). Which size of gravel will be adequate for this system to grow lettuce? You don't even need gravel. I use vermiculite, similar to a raft system. We are looking ways of incorporating eco advantage into West Africa. I have been told by several people that Hydroponics would help to increase food production and help to create jobs. Do you know of anyone doing projects such as this or how we would start? I would be anxious to hear your input in this. Greetings Jeff. I came across your post as I was researching a hydroponic gardening system that I would like to implement in Sierra Leone. How did your project turn out? Did you receive an answer from the administrator of this website? Daniel I would be happy to contribute. When I am able to contribute would you be willing to answer a few more questions I have about some other concepts you have explored in your blog? By the way I want to thank you for hydrobuddy. I belive it is going to be an excellent research tool. Hi, Great article. Your initial links ("here, here and here") are dead though, or may be password protected.